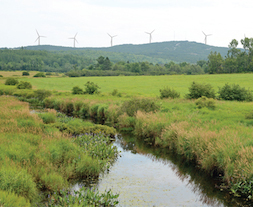 Each time the residents of Frankfurt, Maine have been asked to weigh in on a proposed wind farm on Mount Waldo, the results have the same: “no thanks”—and by ever increasing margins. In 2011, an ordinance establishing a one-mile setback passed by 22 votes; the ordinance also set noise limits of 45dB during the day and 32dB at night (a range that’s in line with what turbines would be expected to produce at that distance). The town was sued by the landowners who were planning to host a six-turbine project; both sides agreed to put the question of allowing the project to go forward to a March 2013 town meeting vote, which fell 47 votes short. This year, a measure to repeal the 2011 ordinance and revert to state standards (55dB day/42dB night noise limit) was on the election day ballot, and that proposal lost by 138 votes, or 62%-38%. The citizens of Frankfurt have spoken clearly and repeatedly. They have said that they want turbines to stay far enough away from neighboring properties that they will be rarely heard. While the one-mile setback (and perhaps even moreso the 32dB night noise limit) make the proposed Mt. Waldo project unfeasible, standards such as these are not inherently unreasonable; indeed, several other Maine towns (including Woodstock, Sumner, Rumford, and Clifton) have adopted 4000-5260 foot standards, rather than outright bans. [The photo simulation above, created by the wind developer, shows a view from about two miles away.] While such standards clearly aim for much smaller impacts on neighbors than more typical 1200-1700-foot setbacks, turbines in the range of a mile away are still a dominant visual presence and can be readily audible; the larger setback/lower noise standards are generally aiming to find a middle ground that allows wind development while minimizing impacts. The Record Hill Wind Farm in Roxbury is over a mile and a quarter from most homes, and those who spoke up about noise issues early on have found that the turbines are only rarely audible—though they still dislike seeing the turbines over the pond and the string of lights at night. A look at Google Maps seems to show more homes within a mile of Mt. Waldo than at Record Hill (a dozen or so, rather than a couple), so the option of getting agreements with all of the closer landowners may not be practical. Across the country, many other towns have weighed the costs and benefits differently and adopted the standard, less restrictive setbacks; they’ve been more willing to accept that a small to moderate proportion of those within a half mile or mile will find the noise intrusive, leading to complaints and in some cases the need to move. It’s altogether right for towns to make their own choices about how to navigate the grey area of how much visual or acoustic impact they’re willing to live with; Frankfurt and other towns like it are making a clear and reasonable decision. It’s time for wind developers to accept such choices, choosing sites and designing projects that fit with local sentiments, rather than pushing towns to loosen siting standards simply to make it easier for particular projects to move forward. UPDATE, 11/5/14: Another Maine town was considering a change in its wind ordinance this week, and that one went the other way, an apt illustration of the self-determination point I just made. Dixfield had enacted a 2000-foot setback in 2012, but in 2013 the Planning Board was charged with revisiting that decision. This past summer, a set of amendments were proposed that would have doubled the setback to 4000 feet, and applied more restrictive sound limits as well: 42dB during the day, 35dB at night (again, about what we’d expect at the greater distance). On Tuesday, in a very high turnout election, the amendments were defeated in a nail-biter, 562 to 557. So in Dixfield, a 20MW wind project that’s been conducting wind and environmental studies for the past few years still has a relatively amenable path toward approval and construction.